"Script" button executes small Lua script when clicked. It may partially duplicate script.dll plugin functionality, but while script.dll is intended to control softphone for arbitrary time (i.e. use delays) script button should be limited to running code that executes immediately. Same scripts can be also executed automatically, on events like call state change (call confirmed, call disconnected, etc. ), registering or unregistering. 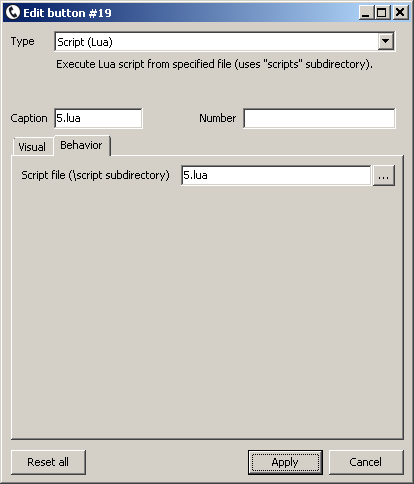 To assign Lua script to button create "script" subdirectory in softphone folder and place script file in this location. Use any text editor for editing script and "print" function for debugging purposes. local caption = "Some dialog caption"
local prompt = "Some dialog prompt"
local defaultText = "Default text"
returns current call state: integer value according to Callback::ua_state_e, i.e. As function list grows some of them were separated into "tsip_winapi" module. Note: for brevity module name is omitted at function definitions. Variables can be also set and cleared by plugins. Along with PluginSendMessageText function they allow bidirectional communication between scripts and plugins - see using FT232RL module as GPIO example. Output of print() is passed to application log window.